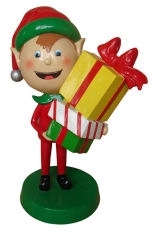 Fiberglass Elf with Gift Boxes - Sold in 2 Sizes - 30" and 53" on base for indoor/Outdoor use. Made of fiberglass and hand painted. Whimsical Elf to brighten any holiday setting or use alone. Dimensions for 30" are: 30" tall X 13" wide X 21.5" base - weighs 15 lbs. Dimensions for 53" are: 53" tall X 22" wide X 30" base. Weighs 48 lbs. Sold one per carton. Call for availability. Call for shipping rates for the 53.5" Elf..